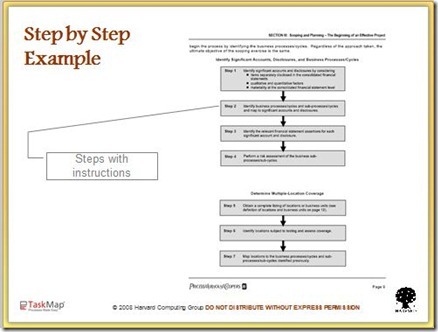 Another approach to documenting processes is the step by step model. Instructive in nature, it will guide the reader through each step. 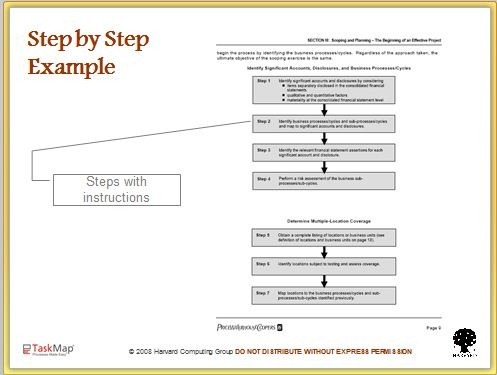 Most steps represent an individual task and describes the outcome. The step by step approach has been with us for many centuries and used in conjunction with illustrations can really make the process clearer for the reader. Today most using this approach will use MS Word, Excel or PowerPoint. Of course web based systems are becoming increasingly popular as well. Copyright 2010 Harvard Computing Group, Inc.